Rap drifted into spoken word then exploded into gravity defying hip-hop dance. 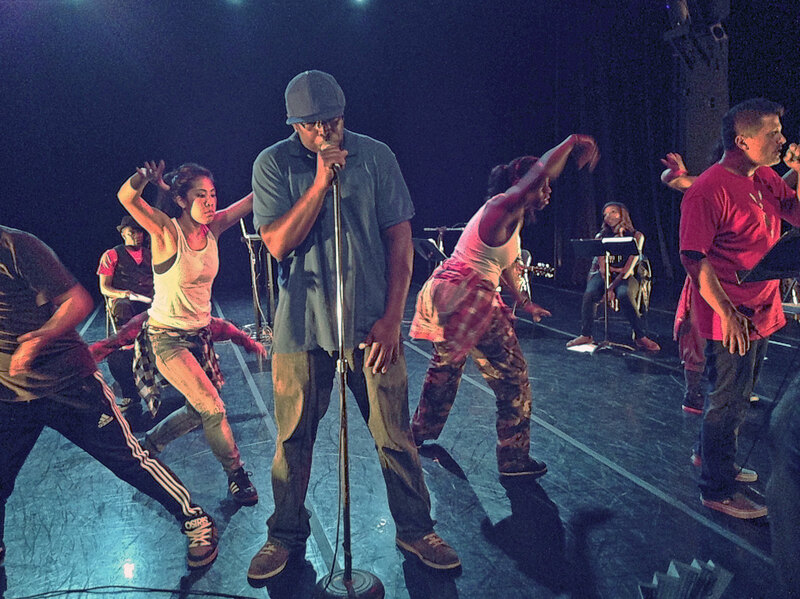 Last night’s performance at Dance Mission Theater featured Felonious, a live hip-hop music and theatrical group, Campo Santo, another Bay Area theatrical group and the Mix’d Ingrdnts Dance Company, a female collective. The performance celebrated Jeff Chang’s book, Can’t Stop Won’t Stop. The performance was the third of four shows in the Bay Area. Although scripted, Sunday night was a unique experience. Music, theater and dance improvisation seemed to ebb and flow as if this were one of a hundred performances. Mission Dance Theater provided a proximity that almost made the audience a part of the show. Dancers emerged from behind curtains or through doors and in one case directly from the audience itself. The sound management allowed every carefully written word to be understood and each Blue note appreciated. The story unfolded in an abstract manner uniquely fused by movement and sound. One moment the actors and dancers were seated in a circle on the floor like children listening to a storyteller. Then the beat would pop the group into dance. Further animation was provided by spontaneous interaction between the actors. The acoustic guitarist said, “So what’s wrong with the robot?” when the computer operated by the beat box player shuddered. Even the audience was engaged at the end of a particularly poignant piece about police interaction in a dead-end neighborhood. The pithy story was presented in a catchy, sometimes light manner. With the last word the actor turned to the audience and said, “You better not laugh.” The audience was speechless, not because of the request, but as a result of enjoying a first-rate Avant-Garde performance. Felonious will next appear on September 8 at the Intersection for the Arts, 925 Mission St.